The best part of the holidays is the way everyone’s just allowed to drink as much as they want to (or maybe as much as they can handle). Here’s the thing about wine pairing. It’s a bit of a myth. Insisting that white wine is the only wine for fish, for example, woefully excludes all of the wonderful pinot noir or Grenache that can really enhance the flavors of seafood. The same is true with all kinds of dishes. Throw away everything you thought you knew about wine pairing! And get a different bottle for each side. No, no, don’t drink the whole bottle for each dish, but definitely have a few “sips” (hard wink). With all the cream and butter that goes into the potatoes, you want a bigger wine that can take on all that fat. Most reds and unoaked whites are up to the task, so look for something with some body. Are your potatoes extreme? With bleu cheese or lots of roasted garlic? Consider something a bit lighter so the wine doesn’t overpower the flavors. Grab a neat Côtes du Rhône, Barbera, Merlot, or Chardonnay. Everyone likes their own kind of veggie on Thanksgiving. So what’ll it be? For Brussels sprouts and broccoli, a Sauvignon Blanc or a white Bordeaux will work nicely. For squash, carrots, and parsnips, go for something nice and dry, with rich texture. Personally, I think that marshmallow-sugary thing people do with sweet potatoes is basically early dessert, and I don’t wanna act like I’ve got beef with dessert, but it’s just not for me. I’m more of an umami person I guess. THAT SAID, sweet potatoes are a holiday-meal staple. So let’s work with it. Tannins are your friend. To counteract the sweet, a dry, astringent wine is a lovely counterbalance. Go for a nice Cabernet Sauvignon. Stuffing can vary quite a bit from recipe to recipe. Which is why this one is pretty open-ended! For richer stuffing’s, grab a Pinot Noir. Heavy-on-the-bready stuffing? Riesling cuts it nicely. The idea is to keep things dry, so have fun playing with that broad criterion. Whether fresh or in the can, cranberry sauce just screams to be paired with a nice semi-sweet white or rosé. That’s right! This is the moment to break out the rosé. You were waiting for this moment anyway. And now it’s here. Pumpkin pie may be dessert, but hey --that sweet potato-marshmallow thing can be sweeter than this pie. Pecan pie is a bit sweeter, too, but either confection is paired nicely with a light sweet white like Moscato or a lighter-bodied red like Pinot Noir. Or, skip the chewy desserts in favor of the drinky desserts. 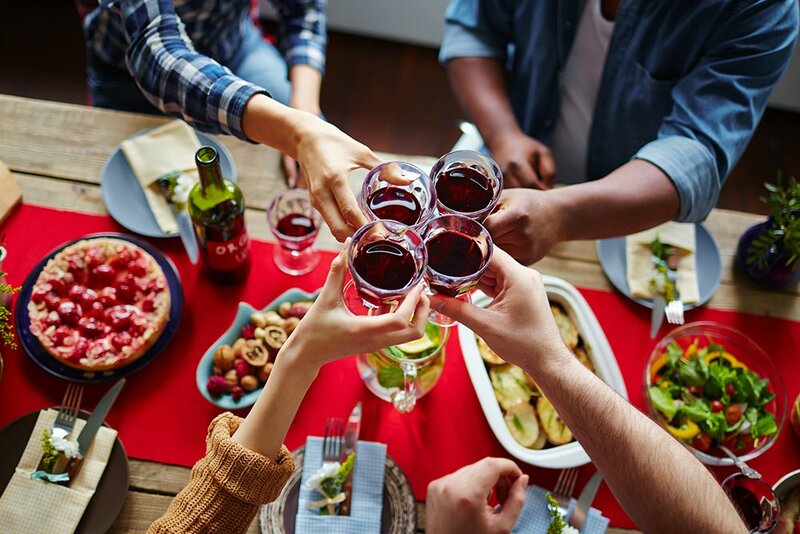 Dessert wines like port or a nice zinfandel can satisfy your sweet tooth and keep you in your glass, which is the best place to be just as the political debates reach their shrillest peak.